Start > All Programs > CardioLog > Uninstall. Note: In order to ensure the continuity of usage data collection in repair/upgrade scenarios, the CardioLog installer does NOT remove the following components during uninstall. If you want to fully uninstall the product, please remove them manually. Service and Web configuration files located in the CardioLog Installation folder (default directory - C:\Program Files\Intlock\CardioLog). (1) Deployed through a SharePoint solution. (2) Automatically added to init.js in SharePoint 2010 and SharePoint 2013, core.js in SharePoint 2007 or ows.js in SharePoint 2003. (3) Manually added to a common Java Script file on your SharePoint WFEs. 1. Deactivate the CardioLog Analytics feature to stop data collection. 2. Retract the solution and remove it. For SharePoint 2013 only - Go to Central Administration > System Settings > Manage farm solutions > Click cardiologtrackingagentfeature.wsp > Click Retract Solution. For SharePoint 2010 only - Go to Central Administration > System Settings > Manage farm solutions > Click cardiologtrackingagentfeature.wsp > Click Retract Solution. For MOSS 2007 only - Go to Central Administration > Operations > Solution Management > Click cardiologtrackingagentfeature.wsp > Click Retract Solution. 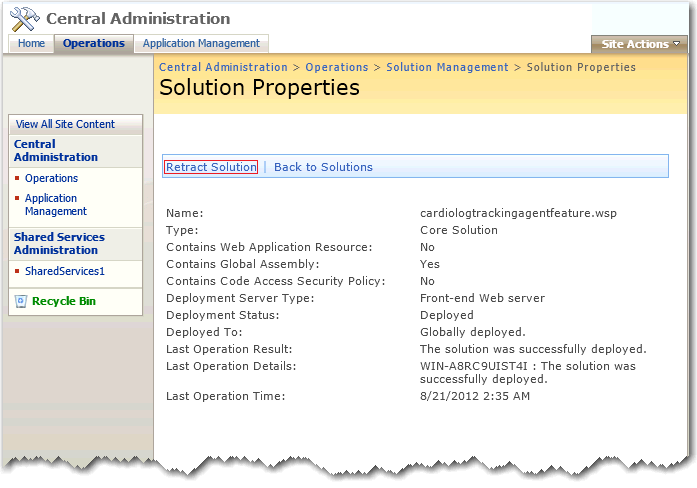 Once the solution status shows "Not Deployed", click Remove Solution in order to completely remove the solution. stsadm -o deactivatefeature -force -name "CardioLogAnalytics"
stsadm -o uninstallfeature -force -name "CardioLogAnalytics"
stsadm -o retractsolution -immediate -name "CardioLogTrackingAgentFeature.wsp"
stsadm -o deletesolution -override -name "CardioLogTrackingAgentFeature.wsp"
To pause the tracking code, browse to your SharePoint Online site Solution Gallery (edit the website root URL): [https://intlock.sharepoint.com]/_catalogs/solutions/forms/allitems.aspx and deactivate the CardioLog Analytics Integration solution. To uninstall the tracking code, deactivate the CardioLog Analytics Integration solution and then delete the solution. Delete your browser cache and verify that when you browse the SharePoint website that you no longer see the CardioLog tracking agent popup when clicking on Ctrl+F12 on the keyboard or when clicking the Agent Console link (follow the instructions in http://cardiologserver:port/CardioLog/Configuration/AgentConsoleBookmarklet.aspx to add the agent console link to your browser). In the SharePoint server, remove the CardioLogHttpModule.dll from the GAC (as detailed here: https://msdn.microsoft.com/en-us/library/zykhfde0(v=vs.110).aspx). Restart the SharePoint IIS server (iisreset). [Installation directory] - by default, the CardioLogAgent folder is located in the CardioLog Installation folder. If the "CardioLog Analytics" SharePoint feature is installed, the CardioLogAgent folder is located on all SharePoint WFEs under the SharePoint website "_layouts" folder.